In welcoming the Spring season, Gap Canada is offering you an extra 50% off on sale styles, plus 40% on regular priced items. Simply enter the promo code GAPDOUBLE at checkout. Some exclusions apply. This offer is valid until March 26th, 2019 at 11:59 PM PT. Gap Canada is also offering you men’s and women’s jeans starting from $34.50 in stores only. Discount taken at register. This offer is valid for a limited time only, while quantities last. 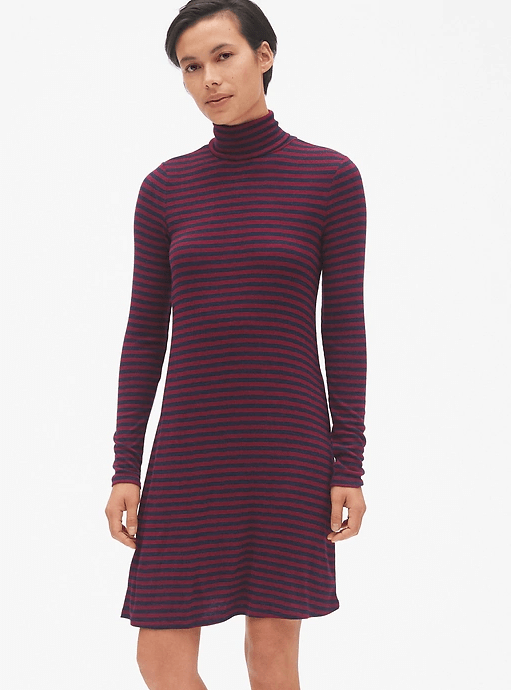 This Long Sleeve Turtleneck Dress in Burgundy Stripe is on sale for $29.99. When you enter the promo code at checkout, you can save an extra 50% off and pay only $14.99. That’s a total savings of $59.96 from the original price of $74.95! Gap Canada offers FREE shipping when you spend $50 or more. Click here to start shopping at Gap Canada.